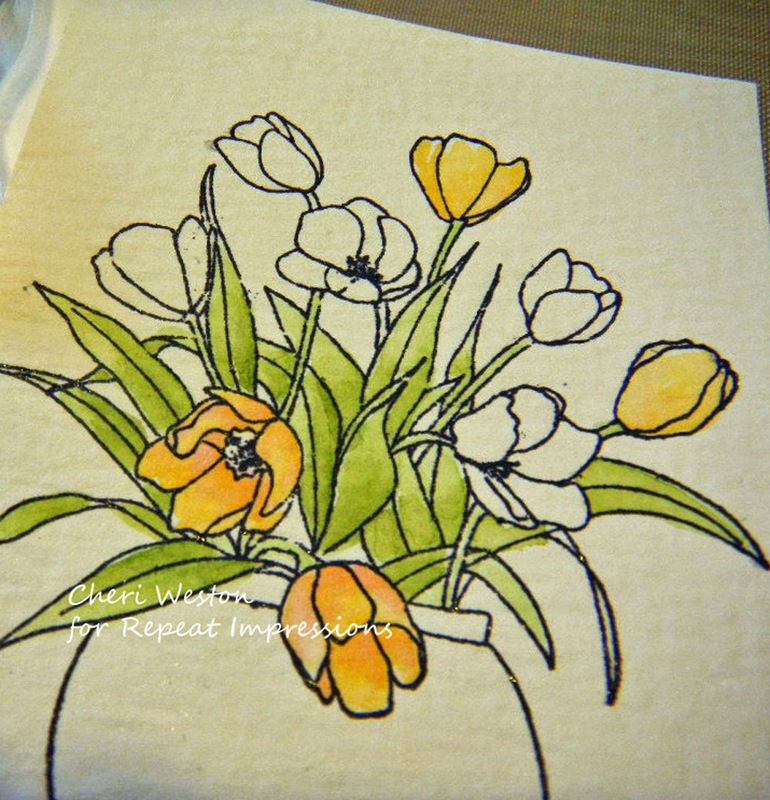 It's my turn, once again, to offer a "Project of the Week" at The House That Stamps Built and today I thought you might like to see some water coloring with Distress Markers. So many of us have these markers and there are many ways to use them, water coloring is only one way. - A line stamp with coloring area is the easiest. 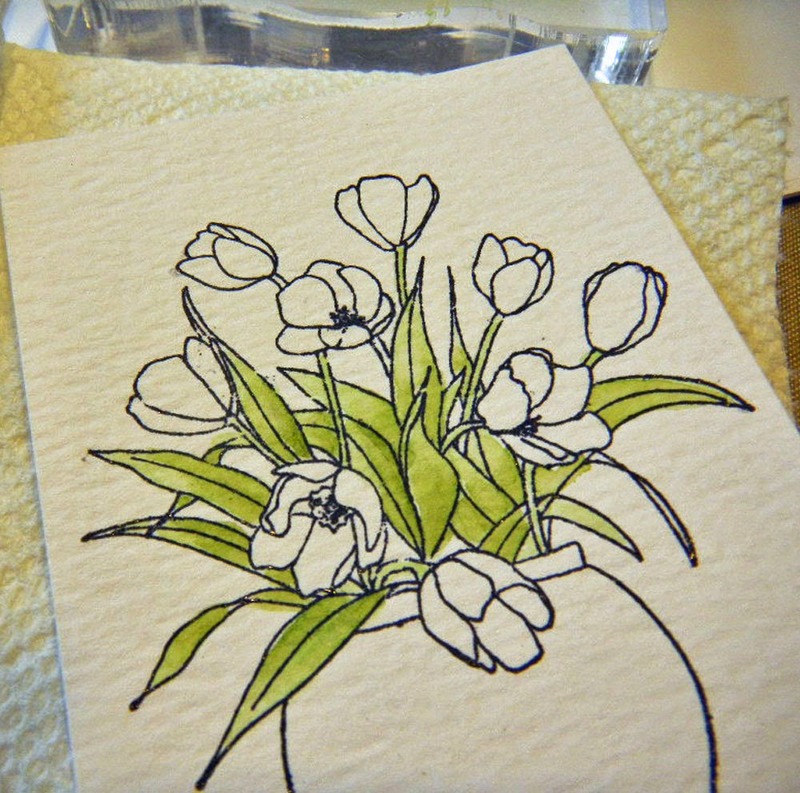 I chose RI #1317-L "Vase of Tulips". - A static control tool to keep the stray embossing powder from sticking on your image where you don't want it. 1. 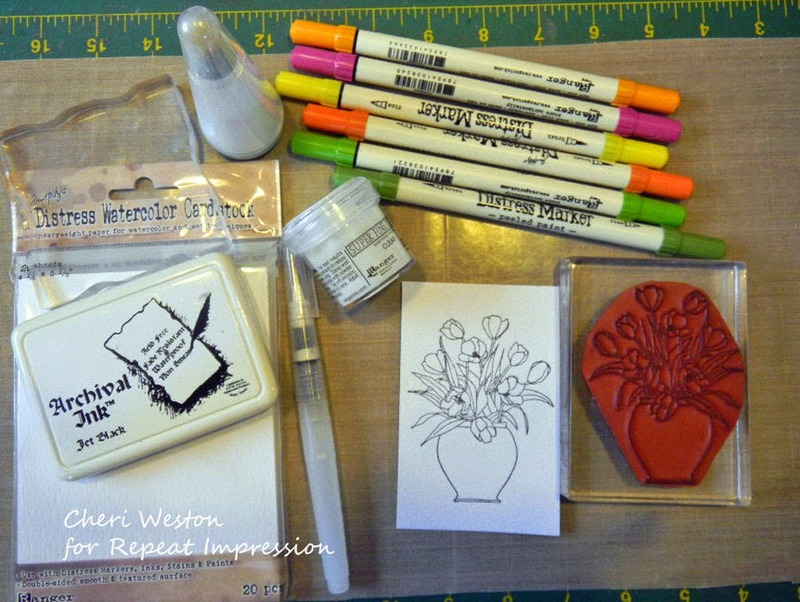 Prepare your watercolor paper with the anti-static tool and then stamp your image onto the watercolor paper. 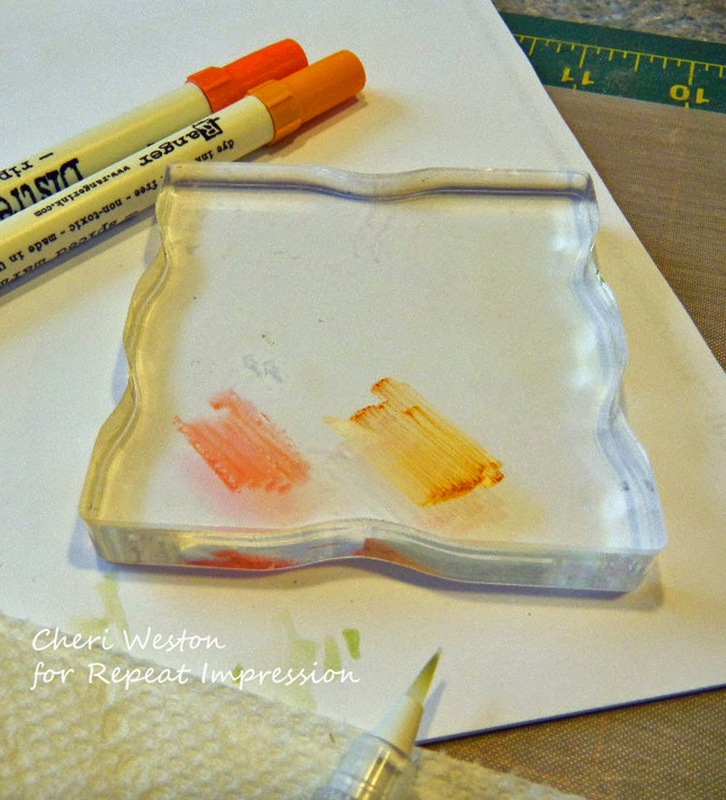 Sprinkle clear embossing powder over the image and heat set it with a heat gun. 2. 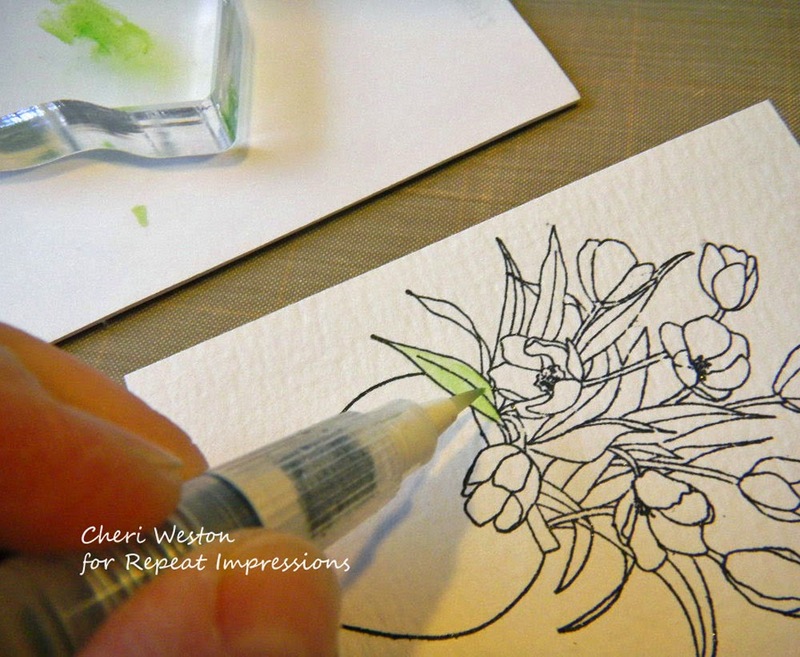 Take your Distress Markers and scribble your first color onto the acrylic block you're using as your palette and with your water brush pick up a little color on the tip of the brush. Go lightly at first. You can always add more color if you need it darker. 3. Paint your image, from the inside toward the outer edge. This gives you light shading effect. 4. When you're ready to shade an area, add a darker color of the same color family to the acrylic block and using the same method of adding color to the brush, add the darker color to the areas that would be darkest. In this case, the depth of the leaves. 5. When you're satisfied you can move on to other areas with more color. 6. I always start with the lightest color and then add the darker where I either want shading or if I want to change the color of the image. If you get too much water in an area, take a paper towel and blot it up. You can always reactivate your colors using just water. I hope you try coloring with Distress Markers and have some fun with this. 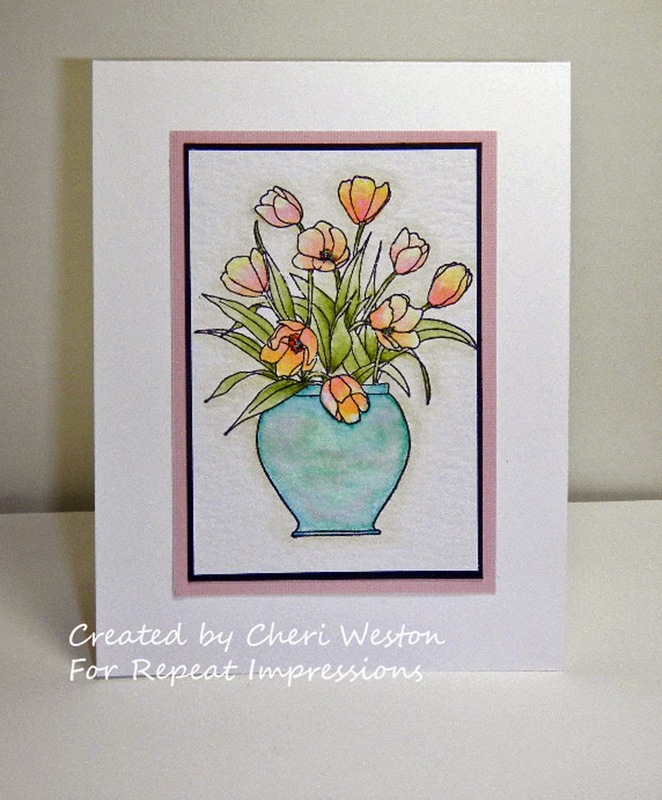 Cheri- You did a wonderful job water coloring this- it is beautifully done! Great project this week Cheri - I love this technique!